This project is the musician’s declaration of their break with the European values of modernity and cosmopolitanism.Despite our efforts to make sure that the events have no partnership with or endorsement of institutions, states or organizations that act against our political or social convictions, Mazzaj has previously been exposed to a situation in which we had to boycott – only hours before its beginning it became clear that another festival was trying to whitewash the colonial, racist and discriminatory behavior of the Israeli state. Since we found no indication of a problematic position of Popkultur in the previous years’ editions, we accepted to participate; everything was ready for our gig, until some days ago when we discovered that the embassy of the Israeli state is a partner in this year’s edition of the festival. 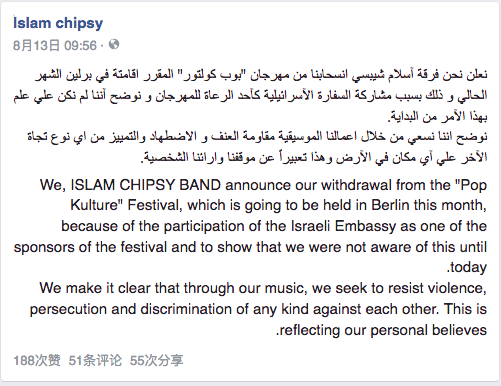 We, ISLAM CHIPSY BAND announce our withdrawal from the “Pop Kulture” Festival, which is going to be held in Berlin this month, because of the participation of the Israeli Embassy as one of the sponsors of the festival and to show that we were not aware of this until today. We make it clear that through our music, we seek to resist violence, persecution and discrimination of any kind against each other. This is reflecting our personal believes. Dear colleagues, you know that you have the power to tell the Israeli government you disapprove of its actions. You have the power to tell the Palestinians they are not alone under occupation and in exile. Please use your power. Please withdraw from Berlin Pop-Kultur. The Palestinian Campaign for the Academic and Cultural Boycott of Israel (PACBI) condemns the Pop-Kultur festival for spreading outrageous lies about the Boycott, Divestment and Sanctions (BDS) movement for Palestinian rights in a desperate attempt to divert attention from its shameful acceptance of Israel’s sponsorship and its resultant complicity in whitewashing Israel’s regime of occupation and apartheid. 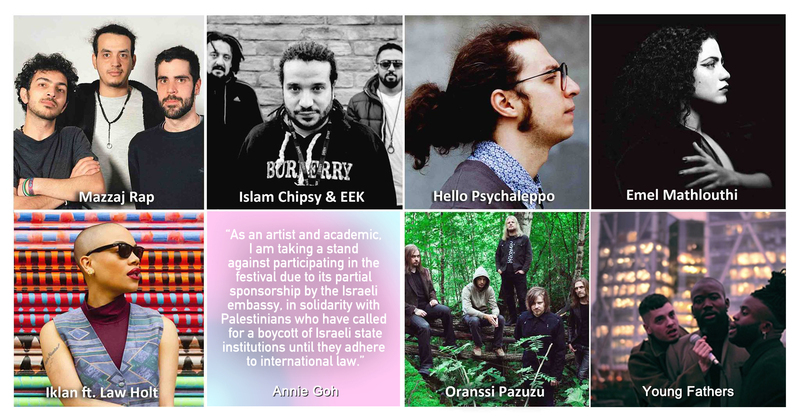 “We, Jewish Voice for Just Peace in the Middle East and Jewish Antifa Berlin, call upon the “Pop-Kultur” festival to cancel its partnership with the Israeli embassy,“ begins a joint statement by two Jewish organizations in Germany. The groups are joined by Jewish organisations from around the globe, weighing in on the issue of Israeli embassies‘ operations and their partners abroad. “Israel openly and actively uses culture as part of its state branding campaign strategy. The Israeli foreign ministry openly acknowledges spending hundreds of millions of dollars annually to improve Israel’s image, “the Boycott from Within statement explains. “Brand Israel” was conceptualised a decade ago, in order to change Israel’s deteriorating image around the world, which has been badly damaged after decades of occupation, apartheid and military attacks. The strategy’s aim is to actively shift the focus of the conversation around Israel from its military regime and its crimes, to its perceived cultural or hi-tec achievements, or- ironically- its so-called “Democracy and respect of human rights“. In response to the predominantly racist and misinformed reaction to our call to boycott Mazzaj-Band would like to clarify our position regarding the boycott of Popkultur 2017. Several artists took the decision to boycott independent from and several days BEFORE the official BDS callout. The organisers of Popkultur and Senator Dr. Klaus Lederer demonstrated with their defamatory and racist statements, that “cultural dialogue & exchange” is nothing more than patronising tokenism. With their vicious accusations of “Fake-News” (sic) and reduction of the artist’s position to their “Arab-ness”, Christian Morin & Martin Hossbach exposed their ugly euro-centrism and discrimination against the artists because of their assumed identity. We demand an apology for their defamations, which we see part and parcel of the hate speech and threats we received. Stop the abusive use of the anti-Semitism accusation. It lacks any kind of historicity in this particular context and ignores the fact that we did not boycott Jews, but an oppressive government. The artists refused to take part in the whitewashing of the Israeli state and therefore cancelled their performance in the festival, did so because of their dedication to actively expose and resist oppression and discrimination. We reject the claim that “culture and politics have nothing to do with each other”, or that an “important chance for cultural dialogue was missed”. To be clear: This is not an “Arab boycott”. All artists, independent from their background, can be instrumentalised to give oppression a nicer face or conflate position of power with opinion. That’s why they can also take active stand against it and we call upon you to not take part in events that endorse oppressive regimes or attitudes. Our boycott is a tool to highlight that culture and cultural production must not be used by any oppressive discriminatory, exclusionary or racist system no matter what forms of oppression, discrimination, exclusion or racism it practices. 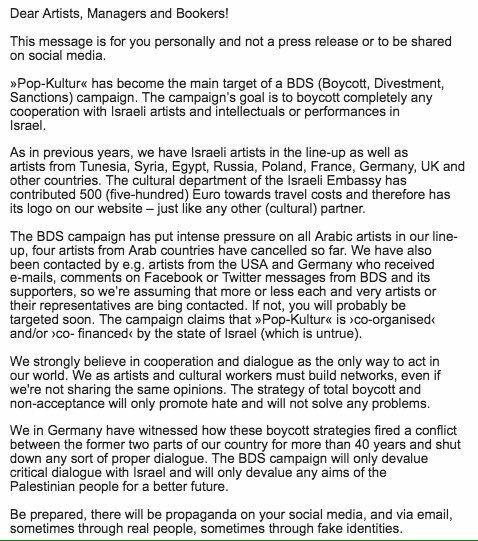 That’s why we took the decision to boycott and reject the organisers of Popkultur’s claim that we “followed a call by BDS”. No, the boycott and exposure of the Israeli partnership was an individual decision that resonated with many. The amount of money that the Israeli embassy contributed or what for is not relevant here, more important is that it is displayed as a partner and its actions therefor normalised and endorsed. Members of the current right-wing government not only repeatedly declared anti-Black and anti-Arab attitudes, it implements these attitudes also on a structural level. The discrimination and persecution of people because of their identity is not an opinion that can be exchanged in an intercultural dialogue. The comparison between our boycott and the abhorrent anti-Semitic boycott campaigns in Germany as well as the accusations of anti-Semitism fail to notice that firstly, our boycott is directed against an institution, not against people because of their identity and secondly, these defamations expose the Euro-centrism dominating the debate and thinking in Germany. In line with this understanding, our criticism of the Israeli state is a stand against any form of discrimination against Jews, as we understand Israel’s claim to represent Jews all over the world as an expression of white supremacy. It shouldn’t be necessary to explain that not all Jews consider the European concept of Nation-states and settler colonialism as way to safety and freedom, but instead fight against discrimination everywhere. Hopefully many more artist will prove that a stand against oppression is not a question of identity or background, but that the exclusion of oppression is a necessity for a healthy encounter and debate between artists. Young Fathers have a long history of opposing any form of hatred including racism and anti-semitism and we support the principle of a peaceful solution that allows Palestinians the right to return to a safe homeland and that allows Israelis and Palestinians of all faiths (and none) to live together in peace. This is a very tiny act on our behalf in the grand scale of things but one we still believe is worth it. Sleaford Mods said their manager Steve Underwood would withdraw from a panel at the festival, in a subsequently deleted tweet. Sleaford Mods’ manager did not pull out of the festival. The group subsequently released a statement emphasising that they did not perform at the festival. We will continue to cooperate with the Israeli embassy in the coming year, so if you do not want to play in these conditions, you should stay at home.